On November 30th, Hereditary Prince Alois received the outgoing ESA (EFTA Surveillance Authority) President Sven Erik Svedman when he paid a courtesy visit to Schloss Vaduz. The ESA monitors and governs the compliance of EFTA members (Iceland, Liechtenstein, Norway, and Switzerland) to ensure there is no infringement on European Economic Area (EEA) laws. 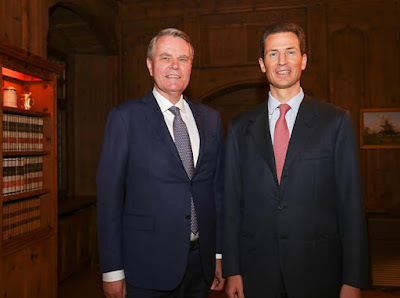 Svedman also met with Foreign Minister Aurelia Frick and Landtag President Albert Frick.